The Hair Clinic carries the largest selection of top quality Alopecia wigs and hair pieces for Alopecia Areata, as well as Alopecia Universalis, and Alopecia Totalis. Alopecia Areata or Patchy Hair Loss is a condition in which hair is lost in patches, resulting in bald spots on the head. It is also called spot baldness. Alopecia Universalis involves total hair loss on the body, and Alopecia Totalis is total hair loss on the head. If you have alopecia, whether it is partial or total, temporary or permanent, alopecia hair loss should not be allowed to affect your life and confidence in a negative way. Baldness is a source of stress for all: hair is an integral part of our identity, both for women, whose hair represents youth and attractiveness and for men, who tend to associate hair with virility and vigor. Hair loss from alopecia is therefore, a highly traumatic event, and many are uncomfortable talking about it. The bottom line is, hair is an important part of your image, and this is where the Alopecia wigs at The Hair Clinic Wig Center comes in. We are here to help. The Hair Clinic staff is not only highly trained in the production and placement of alopecia wigs & hairpieces, but also supportive and always happy to lend you a friendly ear: we will work closely with you to provide you with a custom hair solution that leaves you happy. The Hair Clinic’s Alopecia wigs & hairpieces are virtually undetectable and are made with the finest quality 100% human hair or synthetic Hairlon fiber. Our Alopecia wigs are so comfortable you will soon forget that you are wearing one. Let us make it possible for you to be ultra confident and enjoy seeing your reflection in a mirror with our ultra-natural Alopecia wigs. The Hair Clinic Alopecia wigs & hairpieces are simply the most beautifully made top quality human hairpieces on the market. The Hair Clinic’s human Alopecia wigs & hairpieces are made from the finest quality 100% human Indo-European hair or 100% European hair which always remains silky and soft as long as you take good care of it. The Hair Clinic Alopecia wigs come in a variety of styles and colors, and if nothing in our huge alopecia wig showroom strikes your fancy, we can make a custom alopecia human hairpiece, just for you! We can not only match your color you want but also highlights or even percentages of gray. The Hair Clinic is the only centre that offers you fully custom-made vacuum wigs for Alopecia in Montreal, precision moulded for a fully air-tight & water-tight suction hold. The Hair Clinic Vacuum Wigs for Alopecia are so precisely moulded, they virtually hold on without the need of adhesives, although perimeter adhesion is recommended for swimming & extreme aquatic sports. Vacuum wigs for alopecia totalis or universalis are very different from other types of wigs. They are made of an ultra flexible, translucent polymer which creates a suction only when it is perfectly moulded. Moulding for a vacuum unit can take up to an hour and a half in order to achieve the precision moulding required to form a vacuum hold. You get to choose the amount of hair, the colour, the hair length, as well of course as highlights & lowlights and the final fashion hairstyle for your new custom made vacuum wig. Your consultation at The Hair Clinic Alopecia Center is absolutely free and without any obligation whatsoever. Our friendly, understanding, professional staff and our 5 private consultation rooms are waiting for you. Hair replacement for Alopecia no longer needs to be a stressful or complicated event, it can simply be addressed by The Hair Clinic’s Alopecia Medical Wig Center! 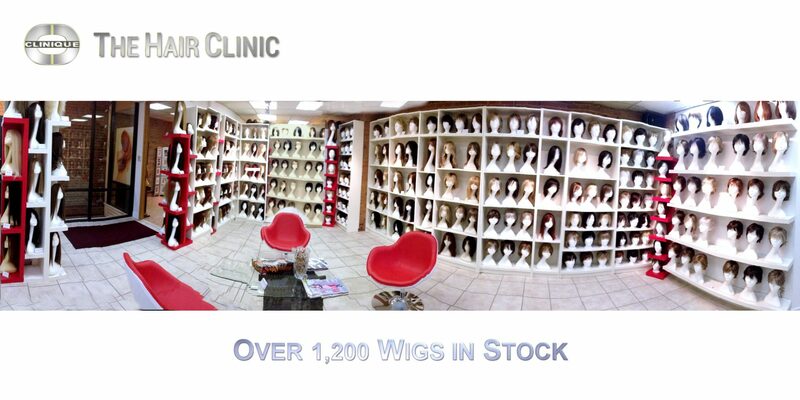 The Hair Clinic offers you the largest selection of Alopecia wigs in Montreal, as well as the option of fully custom-made wigs for Alopecia. The Hair Clinic Alopecia Wig Center makes custom Alopecia wigs & hairpieces as well as partial hairpieces for patchy hair loss due to alopecia areata. Alopecia areata can sometimes result in baldness patterns that can be difficult to cover, but our specially custom-designed hairpieces for Alopecia will allow you to naturally cover the bald spots with perfectly matching human hair – you won’t be able to see where your real hair ends and the custom alopecia hairpiece begins. Your consultation at The Hair Clinic Alopecia Center is absolutely free and comes with no obligations whatsoever. So feel free to make an appointment and take a look at the staggering choice of Alopecia wigs & hairpieces at The Hair Clinic Montreal. You can, of course, decide to drop by to see us anytime! Our friendly & professional staff and our 5 private rooms are waiting for you. Hair replacement for Alopecia no longer needs to be a stressful or complicated event, it can simply be addressed by The Hair Clinic Alopecia Wig & Hairpiece Center! Choose The Hair Clinic for the best quality Alopecia wigs along with professional service. Hot hair is so cool, but so’s a $50 Discount Coupon on your first hand made Alopecia wig at The Wig Center of The Hair Clinic on Crescent Street. At The Hair Clinic, we really can give you the hair of your dreams!